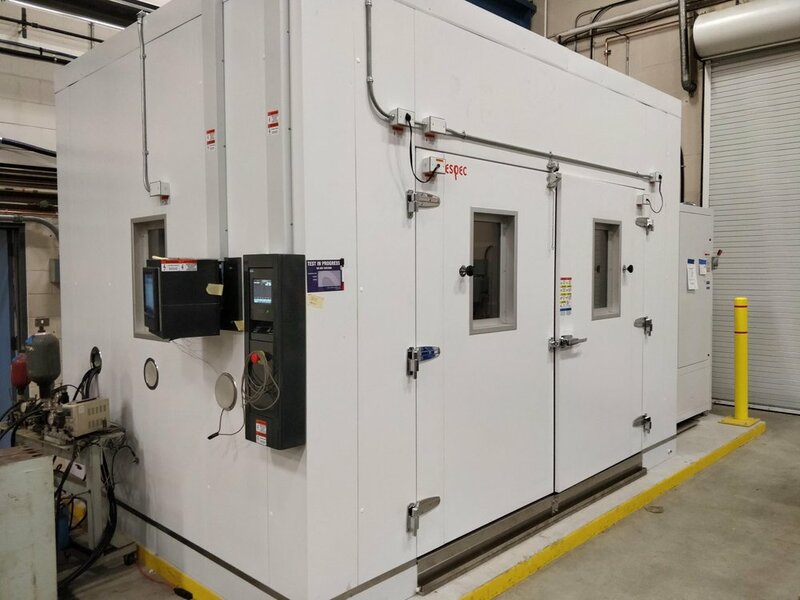 Powertech is offering a new walk-in environmental chamber, with improved capabilities for environmental stress testing, such as: thermal cycling, artificial aging, and service condition exposure testing. The chamber will help OEMs and electric utilities determine the properties and limits of their devices and materials. OEMs and electric utilities have to ensure that new components and systems will perform as designed under field conditions and according to specifications for strength and performance. 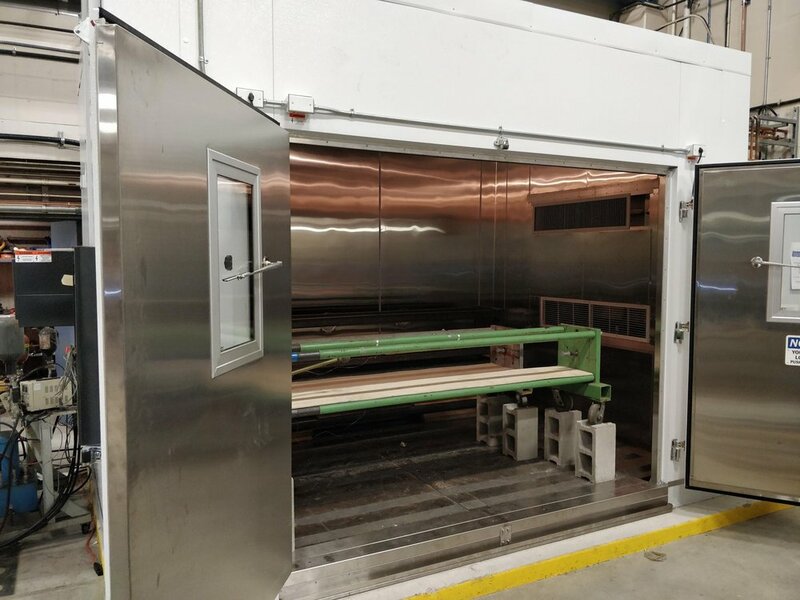 Powertech’s new custom walk-in environmental chamber provides a facility for a variety of stress tests in adverse conditions to determine the limits of use of devices and materials. Typical tests include artificial aging, thermal cycling, Highly Accelerated Life Test (HALT), environmental stress testing, and thermal soak. Results can help investigate structural integrity and maximum stresses in order to enhance product reliability and safety. Environmental testing to extremes:-65ºC to 85ºC, and 10% to 95% relative humidity. Chamber interior dimensions: 153 in. wide x 107 in. deep x 112 in. high. [12.75 ft x 8.9 ft x 9.3 ft]. Door dimensions: 102 in. x 82 in. 8.5 ft x 6.8 ft hinged, bi-parting door; loading ramp. Viewing window 13 in. wide x 23 in. high for test observation. 24 channels available for data recording. Power outlets for powering up test units. Six 6 in. diameter cable ports. With a deep knowledge of materials, lab testing techniques, and industry standards and certification, Powertech’s technical team can provide chamber users with expert consultation to achieve the best results. Powertech can provide raw temperature test data, as well as a formal report of results. Powertech’s Mechanical Technology and Testing Group has extensive experience in many areas of mechanical testing—from research and development to consulting to failure analysis. We work closely with clients in the electric utility, automotive industry, electronics OEMs, and other industries to verify the performance of prototypes in advance of product release and also conduct failure analyses when problems arise. Powertech’s Mechanical Technology and Testing Laboratory conducts tests to evaluate the performance of a wide variety of materials, components, and systems. The laboratory performs testing for vibration/shock, environmental, combined vibration and environmental (HALT/HASS), tension, compression, and impact to simulate in-service conditions or other specifications. Tests are typically conducted according to industry standards; however, custom non-standard test requests can be accommodated.